You have to hand it to Craigbane, they know how to win Championship matches. An indifferent league season and the lack of Lee Moore and Aidy McLaughlin, among others, from their semi-final team sheet suggested a difficult evening for the Lilywhites in Celtic Park against the title holders. Yet 12 minutes was all it took them to book their place in the decider against Greenlough. By the time the clock ticked into its 13th minute, Craigbane were already 1-06 to no score ahead and cruising toward the final. Castledawson have not been convincing in their defence of the trophy and after coming back from the brink in the quarter-final against Lissan, that type of gap was a bridge too far. They deserve credit though. As from the aforementioned 13th minute until five minutes from time they managed to inject the one thing that was missing from the opening quarter of the match - uncertainty. Twelve minutes in, there was only one winner but until Gavin Conwell’s 55th minute free put Craigbane four points ahead a degree of doubt had crept in and that was credit to a much improved St. Malachy’s display. In the end though, Craigbane’s blistering start had given them the cushion they needed. And it was breathtaking. Damian Hasson’s got things underway with a first minute point that Castledawson keeper Neil O’Kane was forced to touch over his crossbar. Ryan Moore added a second as Bliain Gormley and Conwell took complete charge of the midfield area but there was little indication of the deluge of scores to follow. A Conwell free made it three points in as many minutes as Castledawson began looking at each other in disarray. It could have been worse as well as Dara Shivers was forced into a goal saving block on a Conwell shot with Jude McLaughlin sending the rebound inches wide. Castledawson didn’t heed the warnings though. While the shot selection of the St Malchy’s front men sent a constant stream of efforts either side of the Lilywhites’ posts, McLaughlin and Noel Reilly made it six points without reply at the other end. Gormley’s long ball in toward the danger area was completely misjudged by Shivers who could only watch as it bounced over his head and put Ryan Moore in the clear. Moore advanced, side stepped O’Kane and without any doubt, rolled a calm finish into the ‘Dawson net for 1-6 to no score. Twelve minutes gone. St. Malachy’s response to the early deluge had been to introduce substitute Colum Lavery in the eighth minute and it looked an inspired decision three minutes after the Moore goal. With Castledawson heads dropping, Lavery took a Connor Scullion pass and finished superbly to throw his team-mates a lifeline they grasped tightly to for the remainder of the game. After Reilly responded with his second Craigbane point for a 1-7 to 1-0 lead, Castledawson began the slow process of working their way back into the game. Points from Niall McNicholl, Scullion and Paddy Henry still left a five point gap at the interval but 1-8 to 1-3 was much closer than anyone could have imagined in those opening minutes. The second half was a story over Craigbane trying to manage the ‘Dawson threat as a number of their players in white visibly tired. The sides traded scores, Cahir O’Kane for Craigbane, Scullion again for ‘Dawson; then McNicholl for ‘Dawson and Chris Lowry for the Liywhites. It was a pattern that repeated itself for much of the half, Craigbane safe in the knowledge only the concession of a goal would put them in real danger. The switch of Niall Keenan to Ryan Moore had nullified much of the Craigbane threat but the damage had already been done. The defending champions got it back to three points but with ‘Dawson pushing it was Craigbane who looked likely to get another goal. Conwell’s insurance point signified the end of the road for Castledawson and left Craigbane’s championship specialists in another final. 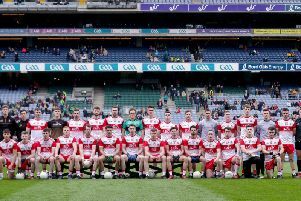 Castledawson: Neil O’Kane; Dara Shivers, Ciaran Lavery, Brian Ludlow; Michael Hicks, Niall Keenan, Danny Devlin; Niall McNicholl (0-2, 1f), Declan Lavery; Aidy Bradley, Kieran O’Kane, Connor Taggart; Aidan Keenan (0-1), Connor Scullion (0-3, 2f), Paddy Henry (0-1). (Subs) Colum Lavery (1-0) for B Ludlow, 8mins; Manus McAllister for D Shivers H/T; Ruairir Shivers (0-1) for C Lavery, 41mins; Gary Chesney for C Taggart, 51mins; Luke Doyle for M Hicks, 60mins.